Safety should never be disregarded. It is kind of astonishing that there are still people that do not use a motorcycle helmet. It is a rare sight but it still happens. This can be extremely dangerous. All motorcycle owners should have at least two helmets just in case a passenger might need one. It’s is not all fun and games when someone can get hurt. A good helmet does not have to cost much. It just needs to be appropriate for the situation and serve its functional purpose. However, it can also look cool at the same time. Over the past few years, motorcycle helmets did receive some improvements but most of them revolve around technology. There are helmets that have built-in walkie talkies, Bluetooth headsets, earbuds and much more. In all honesty, listening to music directly in the helmet is never a good idea. Also, getting the cheapest helmet is never a good idea. Helmets are expensive because of their manufacturing costs, research and development and the safety certifications they need to obtain. A helmet without safety certifications is an invitation for serious injuries. You do not have a cheap head so do not go for a cheap helmet. To avoid unpleasant situations, it is important to always get the helmet from a well-known retailer, not a reseller on a shady market place and it should always be in new condition. 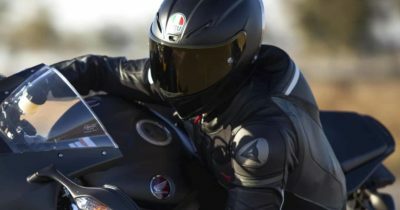 For our list, we were able to pick 10 high-quality motorcycle helmets that offer excellent protection without costing too much. With no further ado here is our list of the top 10 best motorcycle helmets in 2019. The LS2 Helmets Pioneer Trigger Adventure is a great pick for the ones that ride a lot outside the city. It is an off-road helmet with a built-in sunscreen, wide eye port, and an emergency release system. It uses a chin strap that is very easy to unbuckle and it is DOT approved. It is a fairly safe pick with a stylish design having a black glossy coating and white accents. The helmet is also available in other colors and patterns. There are loads of helmets that come with a lower price tag. For the money, the LS2 Helmets offers superior protection. Being DOT certified means that it is durable and lightweight. The helmet comes with a storage bag and can be found in multiple sizes and colors. IV2 Gloss Black full face helmet is a decent pick for the ones that have a limited budget. It is a simple helmet that comes with 2 exchangeable visors. One of them is clear while the other one is tinted. The helmet has a very simple design making it suitable for pretty much any type of rider. In terms of safety, the IV2 is made out of an ABS plastic composite shell and fiber reinforcement. It is DOT approved and features a quick release clip. 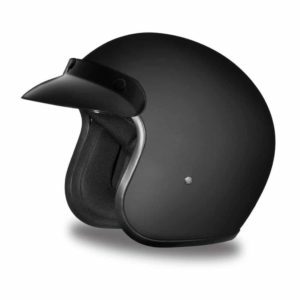 Being a glossy black helmet means that it is a fingerprint magnet. The helm is quite difficult to maintain clean. Despite what the manufacturers claim, it is not very easy to clean but it is very comfortable. Also, the ventilation system makes it a great pick for hot summer days and rides in the city. The protection is decent and the price tag is quite low. 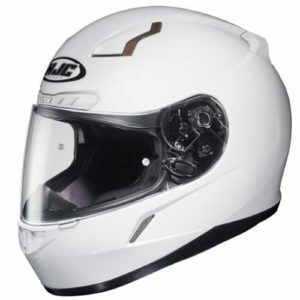 HJC CL-17 is a great helmet for the ones that take safety very seriously. It is one of the pricier models that translates into better build quality and superior comfort. The outer shell is made out of a polycarbonate composite while the interior uses an anti-bacterial fabric. The face shield has an anti-scratch coating and it provides protection against UV light. 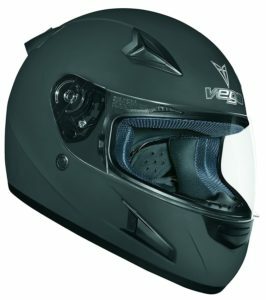 For extra comfort, the helm also features a ventilation system and a quick release clip that makes it very easy to take off. One would expect that when ordering a helmet, it would fit is the sizing is chosen properly based on past experiences. This is not the case with the HJC CL-17. The sizing chart is a bit off and helms are smaller than usual. Ordering a size larger usually solves this issue. Some might be fortunate enough to be fine with the size they usually wear. 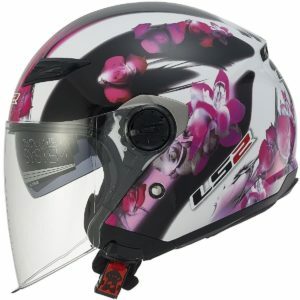 LS2 Helmets 569 Track Floral motorcycle helmet is clearly targeting female riders. The model is available in multiple patterns and colors and some of them have a more unisex design but the floral one is clearly not made for men. The helmet is made out of a lightweight polymer alloy with a twin shield. It is DOT approved and has a quick release system that makes it easy to take off and also keeps it tight onto the head. The interior foam padding is fairly soft but the fit is a bit tight. Getting the usual size a person would usually wear does not solve the problem. It will feel a bit tight and might even feel painful to wear for longer periods of time. The construction is quite decent and safety seems to have been taken seriously by the manufacturers. From a price point perspective, the helmet is affordable for a premium model. 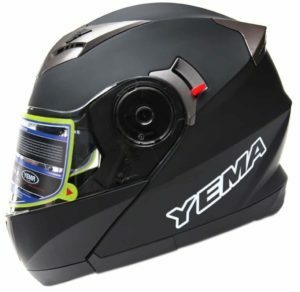 YEMA YM-925 motorcycle helmet is a great pick for beginners and the ones that struggle with a limited budget. 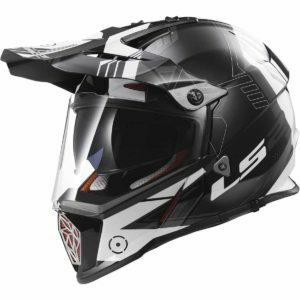 It is an affordable helmet that is DOT approved and features a lightweight construction using an ABS shell. The helm comes with double visors and a drop down sun shield. For the interior, the manufacturers used an antibacterial fabric that is also odor resistant. All helmets have a certain level of noise that can be noticed while riding. This is an effect caused by the wind. How intense the sound is for the rider depends on several factors. For the YEMA helmet, the noise is a bit loud due to the thinner interior layer. It is not disturbing but clearly could have been better if the design of the helmet was changed a bit. LS2 Helmets Strobe solid modular motorcycle helmet is a model that focuses a lot of safety, functionality, and comfort without making any compromises. It looks big for a helmet but it also very difficult to dismiss. It is made out of a lightweight shell with a soft padding. It has a built-in twin shield. One of them is a sun shield. The interior lining can be removed and can be washed. It has a quick release system and a very comfortable fit. The sizing chart used by the manufacturer is quite inaccurate. Most users end up getting one size larger in order for it to fit comfortably. The ventilation is quite good at the helm and the shields will prove to be very useful. Visibility is decent and the protection offered is better than on most other helmets. 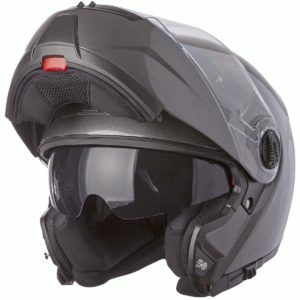 Daytona Helmets managed to offer quite decent products for great prices. Their Cruiser Slim Line helmet is a simple model that is most suitable for rides around the city. It has a very minimal design without a shield. The interior padding is quite comfortable yet it is not removable. The outer shell is made out of a durable lightweight polycarbonate layer and it is DOT approved. Not having a shield is not much of a problem when riding around the city at decent speeds. For this type of motorcycle helmet, it is quite common to see people getting a pair of sunglasses just to protect their eyes against the wind. The helmet is available in multiple sizes and comes with a matte black finish. Unfortunately, it is a bit more difficult to clean but it also does not get dirty all that easy. ILM modular motorcycle helmet is a good pick for beginners. The model was made to be functional and affordable. It has a lightweight construction with a hard and durable outer shell and a removable inner lining to make it easy to clean. As the name states, the helm is available in 10 different colors and patterns and three different sizes. 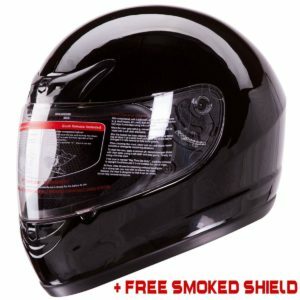 The helm features an anti-fog visor that is also scratch resistant. Usually, helmets reduce wind noise with the aid of the insulating layer. The ILM flip-up modular helmet is not very good at blocking the wind noise. It can be a bit disturbing but this is not a major negative aspect. The low price tag still makes it a rather good option for pretty much anyone whom might be looking for a helmet without breaking the bank. 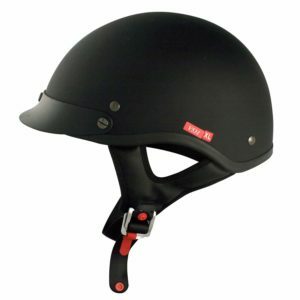 The Vega X888 is a typical sports helmet that is also one of the most popular types based on sales. One key selling point is the low price tag which makes it easier to reach. The helmet is DOT approved and has a lightweight construction. It comes with 9 different shield options such as various tins, anti-fog coating and mirror effect. The helm offers decent ventilation and fits quite well without feeling uncomfortable. Is a bit of a shame that the liner is not removable. These days almost all helmets have a removable liner to make them easier to clean. During the hot summer heat, it is quite common to sweat a bit and thus get the liner impregnated with sweat. Cleaning the liner is nearly impossible. It is still a great product especially for the price tag it goes by. 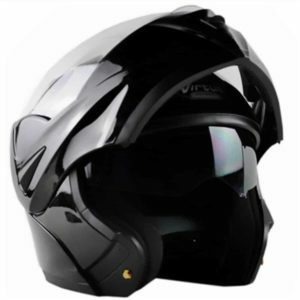 The VCAN V531 half helmet might not look like the safest model in our list but it works just fine when used around the city. It has a very simple design with an ABS thermoplastic resin shell and a soft lining. The inner padding is very comfortable and it is removable to make it easier to clean. The helm uses an adjustable double ring chin strap that keeps it secured in place and makes it very easy to take off. If the inner layers are thick it means that the helm does a good job at absorbing impacts. Sounds like a good thing but sometimes it can be a bit too much. The helm has a mushroom aspect on the head just because it is a bit too thick. Some might like it this way others might complain about it. Usually, people choose a motorcycle helmet based on their design. The way a helm looks seems to be important but it is equally important to get the right type of helmet. There are several different types and not all of them are ideal in all situations. Half Helmet. Half helmets are smaller and work better in the summer. They do not get as hot inside as regular full helmets. Modular Helmets. Modular helmets have the front mask removable or it can be raised completely. This gives them a bit of versatile as they are excellent for long rides and around the city. Full-size helmets. These are the most popular ones. They have a simple design and swappable visors. Odds are, these will be the most common ones seen on bikers. Enduro helmets. Enduro full helmets are usually made for rides outside the city, on off-road terrain. They offer better protection and good ventilation. I have recently started a website, the info you provide on this website has helped me tremendously.